Located on our 5th floor, our new 24-hour, fully accessible Guest Amenity Room provides you with a comfortable, naturally-lit “one-stop” convenience area to help make your stay more enjoyable. Simply use your room key to access. Enjoy a complimentary coffee or tea, and relax in comfortable seating while watching your favourite programs on a new 42” television. Or, stay connected using our complimentary computer station. 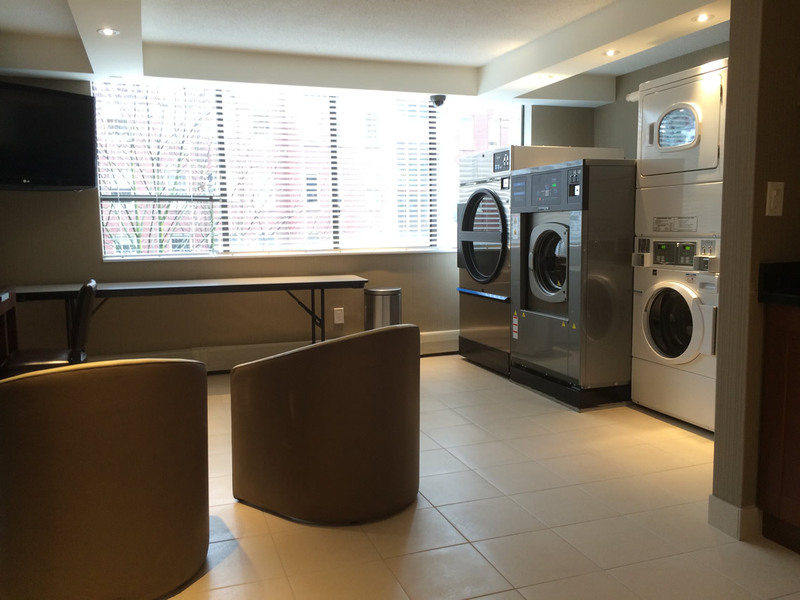 For your laundry needs, we have brand new coin-operated washers and dryers, including one set of high-capacity models. We also provide vending machines for change, laundry detergent and fabric softener. As well, there is a large sink available for hand-washing, iron & ironing board, and a large table for folding and sorting. An ice machine is also located in this room for your convenience, as well as a coin-operated photo booth, with all proceeds being donated to Pacific Autism Family Centre.